News reporting ECB declining growth´s perspectives weighed on the shared currency. US Indexes poised to open sharply up and at fresh yearly highs. 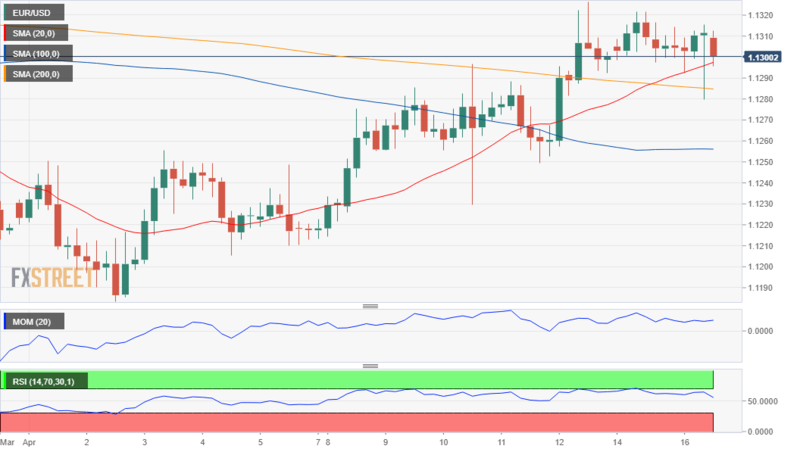 The EUR/USD pair remains afloat thanks to a sudden bout of risk appetite mid-European morning that sent European indexes sharply up and Wall Street's futures to fresh yearly highs. The pair bounced from a daily low of 1.1279 that came following headlines that several ECB policymakers think that the bank’s economic projections are too optimistic as growth weakness in China and trade tensions persist, raising doubts about growth in the second half of the year. Furthermore, policymakers are said to lack enthusiasm for sub-zero tiering. In the data front, the German ZEW survey gave a light of hope, as economic sentiment improved in the country and the Union, with the index printing 3.1 and 4.5 respectively in April, largely surpassing market's forecasts. Current Conditions in Germany, however, declined sharply, down to 5.5 vs. the 8.0 expected and the previous 11.1. According to the official report, the slight improvement was largely based on the hope that the global economic environment will develop less poorly than previously assumed. Sentiment is leading the way in the absence of first-tier data and so far, market players are unsure whether the solid rally in US equities will require an increased demand for the greenback. From a technical point of view, the pair tested the key 1.1280 support area before bouncing some, battling with the 1.1300 level and still capped by a Fibonacci resistance and its recent highs around 1.1310/20. In the 4 hours chart, technical indicators declined further within positive ground, while the price briefly pierced a bullish 20 SMA, now back above it. The risk is skewed to the downside, yet further slides should be confirmed on another attempt to break below the mentioned 1.1280 price zone.